Mahansar (Sometimes written as Mehansar) is a village situated at the border of district Jhunjhunu, Sikar and Churu , once the part of Panchpana estate of Maharao Shardul Singh Ji, Mehansar was awarded to Thakur Nahar Singh Ji who built the Mahansar fort in year 1768. The trading activity of ornaments and other valuables was at a high in ancient times in Mahansar, although with the migration of trading community to bigger cities the activity has also stopped. However Mahansar has maintained it’s heritage liquor brewing tradition, today the heritage liquor made with old royal formulas is famous across the world. The main attraction of this particular village of Shekhawati is the Royal Heritage Liquor. The royal scions Mr. Rajendra Singh Shekhawat has nurtured the traditional drink by preserving the recipe. Today the Mahansar brew is producesd under Heritage Liquor brand. This heritage drink is purely made from herbal produces, ghee and dry fruits. One can not easily forget the taste and blend of the heritage liquor easily. 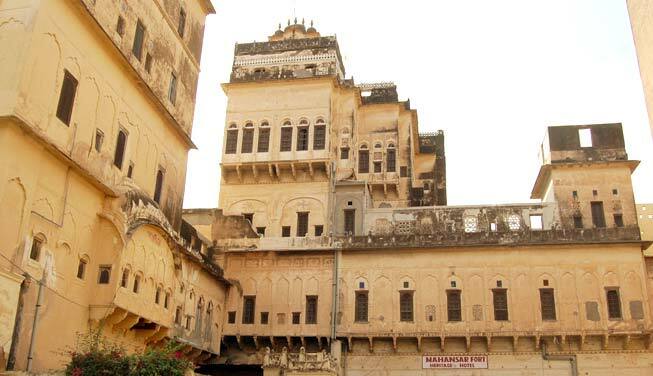 The Mahansar fort, Narayan Niwas Palace and Sone-Chandi Ki Dukaan are the famous places to visit in Mahansar. Sone Chandi Ki dukan’s ceiling is a fresco rich site, there are various mythological depictions made in the inner roof. The royal fort is now operating as a heritage hotel now. Tourists can stay there during the visit. Mahansar is directly connected through railways and road both. The nearest towns are Churu (18 KM) and Jhunjhunu (40 KM). Churu is direclty connected with new Delhi through rail. The nearest airport is Jaipur International Airport (250 KM). Really fascinating journey it was. Although Rajasthan is no doubt most lavish and great state of India through travelling aspect. thanks for coming here and sharing these memorable movements with us. If you want to search anything like 5 star hotels, resorts, shopping malls, taxi services etc ..in chittorgarh please explore chittorgarhinfo for hassle free travelling experience. Mahansar (Sometimes written as Mehansar) is a village situated at the border of district Jhunjhunu, Sikar and Churu , once the part of Panchpana estate of Maharao Shardul Singh Ji, Mehansar was awarded to Thakur Nahar Singh Ji who built the Mahansar fort in year 1768. The trading activity of ornaments and other valuables was at a high in ancient times in Mahansar, although with the migration of trading community to bigger cities the activity has also stopped. However Mahansar has maintained it’s heritage liquor brewing tradition, today the heritage liquor made with old royal formulas is famous across the world. The main attraction of this particular village of Shekhawati is the Royal Heritage Liquor. How can we procure these heritage liquors?Is it possible to get it in jaipur?